Even though this chicken is breaded, it’s absolutely keto-friendly. Traditional bread crumbs will not work on a keto diet because they have too many carbs that can kick you out of ketosis, but there are plenty of other gluten-free and keto-friendly options which provide the same crispy, golden brown crust. 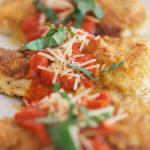 For this recipe, we’re using a combination of almond flour, seasonings, and flavorful parmesan cheese. Parmesan cheese also has some surprising health benefits you may not know about. One of the main issues people run into when starting a ketogenic diet is electrolyte imbalance. A lack of sodium, potassium, and magnesium can cause issues such as the keto flu. Parmesan cheese is rich in sodium, which is a vital mineral your body needs to function properly. Preheat a cast iron pan of large skillet and coat with olive oil and butter. Set to medium-high heat. Add chicken to pan and cook on each side for 4-5 minutes until golden brown. Garnish with freshly chopped parsley, fresh herbs, sliced mozzarella cheese, and low carb marinara sauce. This was delicious. A tad salty but when paired with zoodles and a little marinara sauce– perfect. Just made this tonight. Wonderfully easy, flavorful and absolutely delicious! Going to use the leftovers to top a ceasar salad. Thank you so much for sharing!!! Just made this tonight and it was delicious! Had it with lemon garliC cauliflower rice.